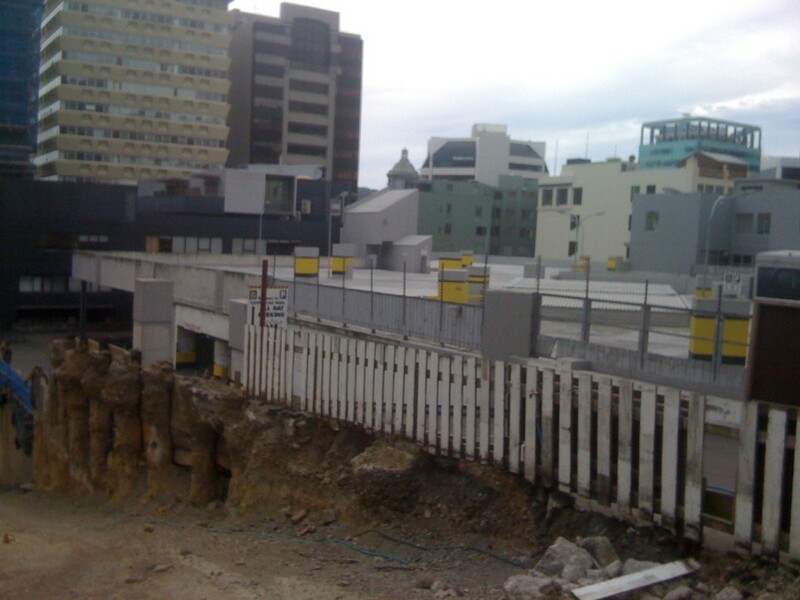 While this job will be underway for a long while yet, we thought that it would be good to see some updates on the impressive great hole that has been dug between Willis St and Boulcott St. 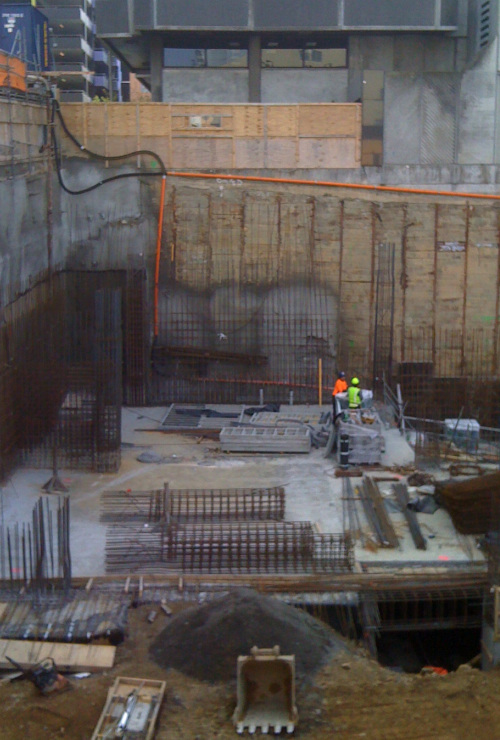 They have reached the bottom some time ago, having dug out several thousand cubic metres of dirt, and they’re now filling in the hole – working their way up from the foundations to form the lower floors of the massive Willis Central project. 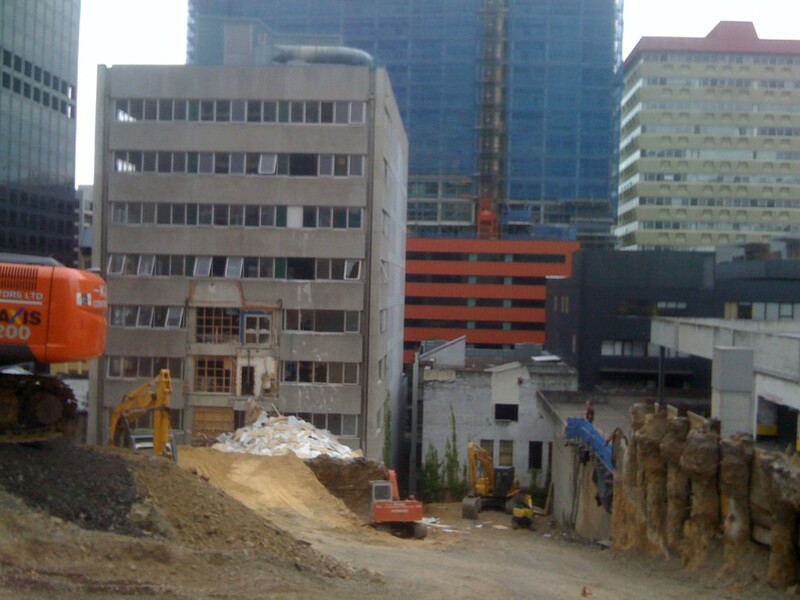 Meanwhile, down on Willis St, the old Vault building (and previous home to the colourful practice of John Mills Architecture), the old building was being cut and gutted, sliced and diced, until just a thin wafer of building was left along the Willis St frontage. and then turning back to the Boulcott St side, we can see part of the massive piling job down the side of the neighbouring building – and the new basement work infilling it all back in again. 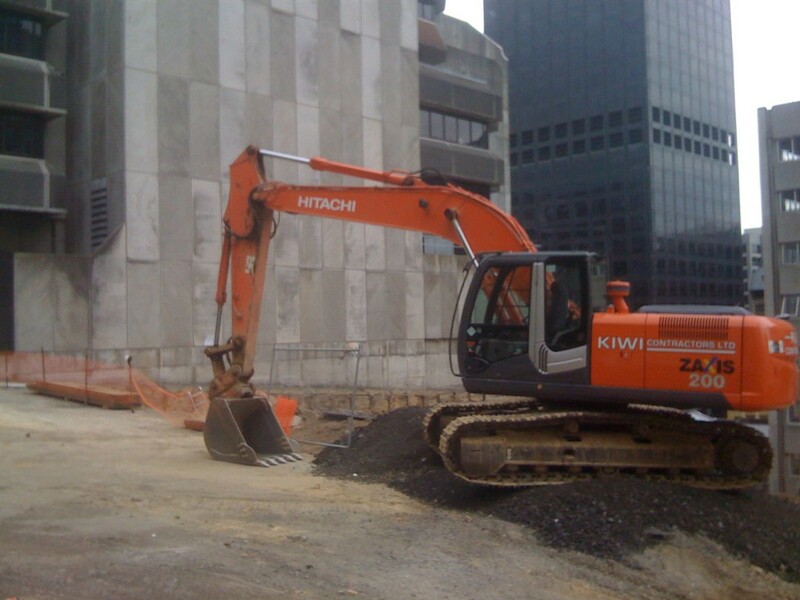 As far as I can tell, there is just 1 or 2 diggers – hard-working orange Hitachis – and a very proud digger operator, who have dug out all that dirt. Probably the biggest job he’ll have in his life – unless he gets a job building a dam on the Clutha. Tomorrow (or at least soon) we’ll explore the new building itself. And that’ll be the biggest job ever (so far) for Architecture Plus as well…. I was just thinking the other day where we would be without steel and concrete… because they sure are using quite a bit of it in this build. Are there many artists impressions floating around? Me, I’m too busy being excited about the Metro possibly being installed around the corner from my house. (I was expecting it to be where the furniture place behind Hallensteins on Cuba, or on that big empty lot on Bute and Vivian, but it looks like it’s going to be the back side of the Bristol Court now – in an area of dense convenience (Nic Nac’s, by the way, has the city’s best pick’n’mix candy – imported from Spain, apparently). There will now be 5-7 grocery type places within ~100m radius. That’s fine by me! They’ve taken the facade off the high(er) rise building on the site… the old dull gray one which even the most optimistic person would struggle to find something nice to say about it. But they’re going to reclad, rather than demolish it? Is that what you’re calling the Airways Building, Max? 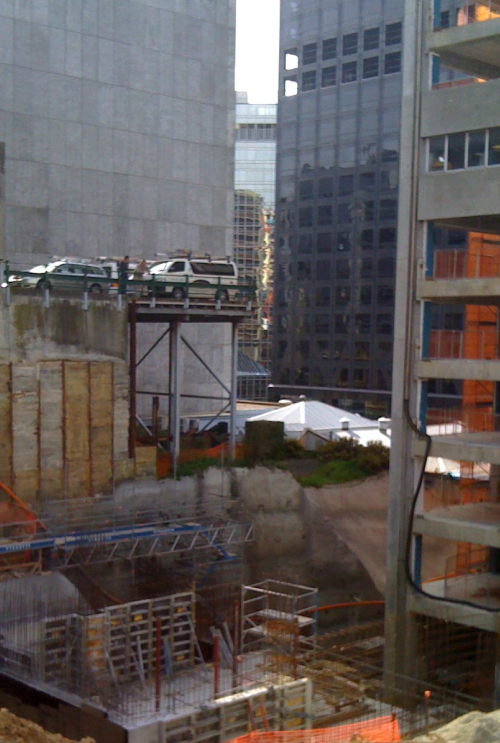 yep – the old building, the Airways bldg, has been stripped to a bare frame.